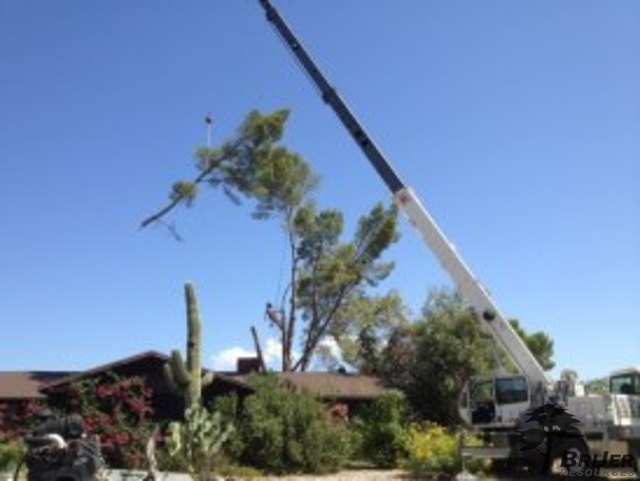 Sometimes the safest and the best way to remove large trees is with the use of heavy machinery like this crane in Tuscon. Some trees are either too big or are located in an awkward position in the yard, making removal a very difficult and technical process. For jobs like these, Top Leaf relies on crane removal, an increasingly more popular method. Top Leaf’s ISA certified arborists always operate with the customer’s needs and best interest in mind. For some of the more difficult removal jobs, this includes crane machinery. Call the Top Leaf professionals today at 480.833.6465 to discuss how to best remove difficult-placed trees from your yard. With more than 10 years of experience in the Phoenix valley, Top Leaf provides you with a satisfaction guaranteed service and the highest quality of craftsmanship.